With all the Google updates and penalties kicking in, getting to (and staying on) page one is proving to be an increasing challenge. So how can you consistently keep your content up to par with the latest search engine standards? While content may still be king when it comes to digital marketing, the user is the queen, and everyone knows the queen is really in charge. So what does this mean for those of us in the industry? Quite simply, how your content is ranked and how it actually works for the user are more closely tied than they ever have been before. Not only do we have to pay attention to types of content, we also need to pay attention to how different types of internet users may respond to these content. Mostly due to advances in AI and machine learning, Google, rather than looking at keywords and more traditional SEO signals, has started to analyze sites closer to the same way a human user would. Which emphasizes how important it is to keep the user as the top priority when it comes to producing content. Leave a user dissatisfied, or drive them away with a poor user experience, and you risk losing more than just traffic. You risk Google taking notice and your site dropping in the rankings. Staying on page one is hard enough without engaging in such self-sabotage. So how do we use content to keep the users (and Google) happy with us? Most of the time, Google queries are actually long-tail questions. Take the question “How can I sell tickets to my event online?” for example. It turns out this is a fairly popular question, and depending on your search history and where you live, your search results will contain a set of ads at the top and an organic set of results below that. The results I got look like the SERP below. 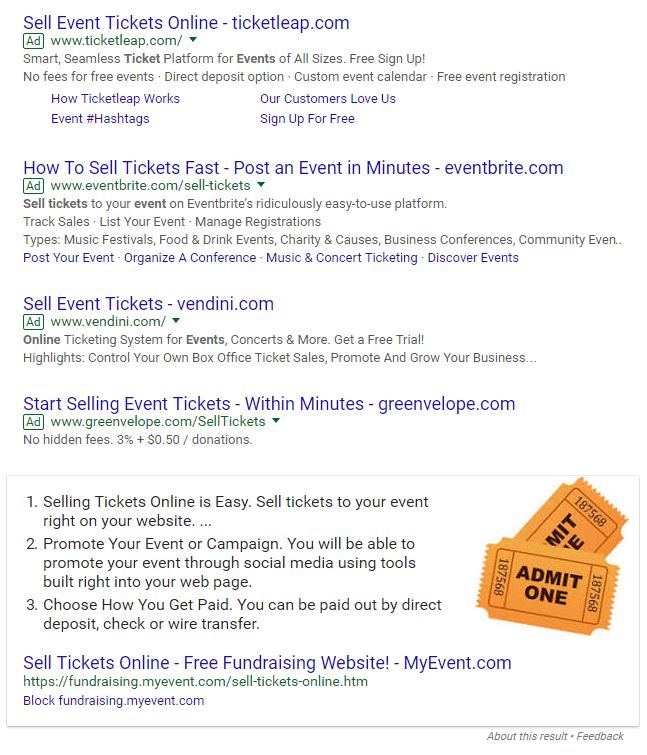 Note a couple of things: the top ad result is Ticketleap, a large site in the niche that allows you to create events and sell tickets to nearly any kind of event online. Why does Ticketleap rank at the top of the ads in this case? Well, first, they have a number of enterprise clients. Also, they have a section called Events University where you can learn how to set up your event and sell tickets. But more importantly, they handle tickets for many local TEDx events, and I had just purchased tickets from them for the one in my area. The site’s functionality, coupled with my past history of using the site’s service, told Google I would most probably be interested in visiting this site again. Just below the ad section is the second most important thing in this image: a smart snippet answer. You can get to this spot by publishing what Google determines to be the best answer to a particular search query question. Having your content show up as a smart snippet answer on Google is a great spot to be. You’re technically ranking #0 for a query. If I turn and ask my Google Home speaker “How can I sell tickets to my event online?” it will read me the snippet answers in the form of a list. Again, note that the site that ranks #0 does not have a higher DA or better metrics. It simply answers the question better—at least according to Google. What question are your customers asking? How can you best answer it? Is there a way to open your blog post or create one with the best answer to that question? If you can use strategies to get to first-page ranking, you can strategize to rank for Smart Snippets too. Different users are searching for different types of answers, and you need to be responsive to all of them. Streakers: These are users in search of a quick answer. The smart snippet, a photo, a quick list, or a short form article will most often appeal to them. Stroller: These users are looking for a more in-depth answer than the streaker, but they aren’t looking for a long answer either. They might stick around for a brief video or photo tutorial or a medium to long form article, but not much more. Studier: This is the user who really wants to drive in deep on a subject. They probably got to your site through multi-thread exploration, and they will fact check your content against other sites. In-Depth Researcher: This is the rarest type of internet searcher: they are looking for peer-reviewed academic documentation of a subject. They are often students or professionals who have a specific purpose in mind. Establishing yourself as an expert and a source for these users will benefit you in that they are also likely to share their findings. Your goal with content should be to convert streakers to strollers, strollers to studiers, and even studiers to researchers when possible. This means having a variety of content in various forms targeted at various areas of the marketing funnel is essential for your content marketing to be successful. To understand this, let’s look at the marketing funnel while keeping these types of users in mind. This is the phase where get the user’s attention to spread awareness of your brand. This attraction or awareness phase is often overlooked for a number of reasons. It doesn’t feel or look like marketing. 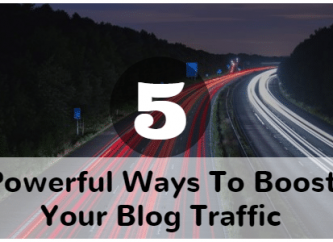 Often, when someone who does not understand content marketing looks at blog posts made for this purpose, they wonder what you are doing with their money, and why you are even creating this content. Blog posts meant for the attraction/awareness phase do not necessarily even mention your brand or anything about you. These posts often speak to what your company does, and many even guide the user how to do a process (related to the service you’re offering) themselves. For instance, we can look at a company that develops software and custom apps for companies. 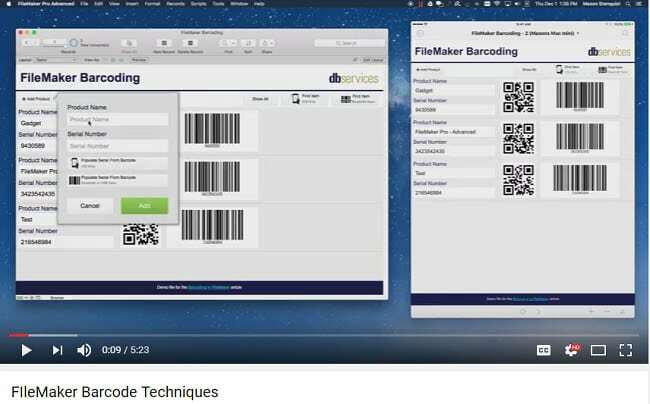 Here is an article on Filemaker Barcode Creation techniques. Filemaker is a program used in the creation of apps and custom company software. 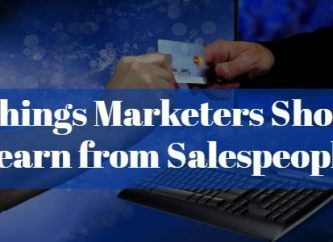 Your company may be interested in this for any number of reasons: creating name badges, selling merchandise at shows, simple inventory, and more tracked in your own proprietary software seems really attractive. The point that hits home though is this: you can create barcodes for your business using this program. If it seems like it would be too difficult or time-consuming with your current staff, the software company who runs the blog can do this for you. The post does not continually mention this, nor does it have to. From the depth of the knowledge shared, it is obvious the company knows what they are doing, and it is pretty easy for the searcher to discover how and where to hire them. If the user does know what they are doing, this tutorial may save them time, and they will visit the site again when they need similar information, recommend the tutorials to others, and may or may not hire the company to create something else for them in an area where they are not as capable. There is no losing with top funnel content. If you consistently produce expert-level content, the company increases its exposure and improves its reputation, not to mention even gain an increase in organic traffic to their website, which will help with rankings. This is based on the principle of reciprocity: you give something valuable to someone, so they are more likely to spend money on you in the future. Top of the funnel content can include free tools, long and short form content, and even photos and videos. The idea is to attract all the different types of users. Top of the funnel is not just the place for fluff: it needs to include all content types. NOTE: Look around and do a simple analysis of your competition, especially those who outrank you on Google. There are a number of things to look at, including how they structure their website and what the overall online experience looks like, but you will discover how they are handling their marketing, and what their content structure looks like. Don’t just copy their strategy: look for your own niche where you can easily outperform them. Mid-funnel is designed to take those attracted to your website by virtue of your top of the funnel content to the next stage: to choose your brand to solve their problem. At the top of the funnel, you answered user questions, sometimes even teaching users the process for solving their problem themselves. In the middle of the funnel, the consumer knows they have a task they need to accomplish and have also determined it is something they need help doing. That help may be anything from a mop to clean the kitchen floor or a pan to cook in. It also may be building a website, choosing a college to attend, or buying a new car. There is no niche where top, mid, and bottom funnel content do not belong: every brand who wants to win long-term in a marketplace where consumers get information digitally must have a content marketing plan. At this point, you are trying to illustrate to the consumer that your brand is the best choice for solving the issue they have. 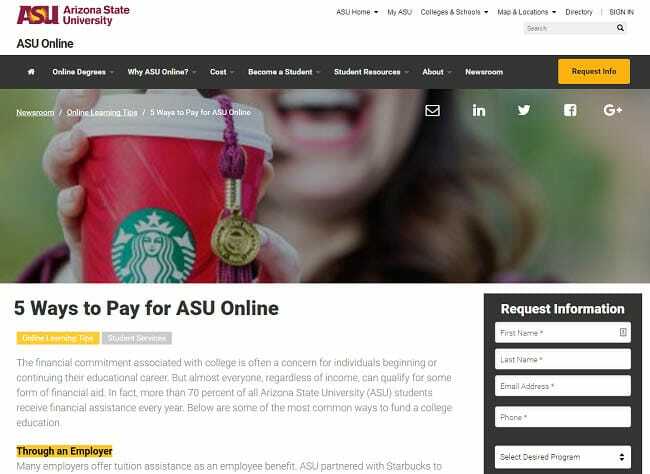 Here is an example of how to do that from a college website, Arizona State University. The university website contains a ton of top funnel content talking about online vs. traditional classrooms, how to choose a major, and why college accreditation matters. It assumes the student has chosen online classes. It assumes the student has chosen ASU as a place to take those classes in. The difference is, the article answers the question relative to Arizona State, and is no longer generic. The principles outlined could apply to other universities, but that is not where it is situated in the marketing funnel. The same content can live on both the top and middle of the funnel. How it is written depends on the user it is trying to target. By this point in the journey, the user already knows that. They now need to know how to pay for the specific college they have chosen to attend. At this point, the user has been wowed by your generosity in sharing knowledge. They have been equally impressed by your brand, and you have managed to make them aware of the benefits of choosing to work with you. However, you have one more step. You have already turned the streaker into a stroller. The stroller has become a studier and learned about you and your brand. The studier and researchers have decided you have the answer or answers they were looking for. Now you have to close the deal. 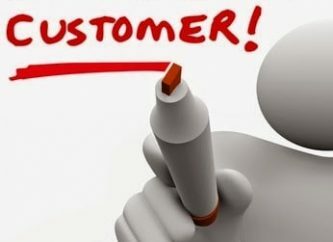 You have to turn them into customers, and you have to keep them delighted. This is where your order forms, product descriptions, the user experience related to the purchasing or conversion process, must be just as good and professional as the rest of your site. Make no mistake: this is content. Your forms and the language surrounding them are as much a part of content marketing as the top of the funnel. But how do you satisfy the four types of internet users here? Make it easy to buy: The streaker does not have time to wade through a process. Offer easy-to-find explanations: The stroller may need to know a little about the process before they press buy. Offer links to these and other deeper explanations these users may need before they are willing to press the buy now button. The bottom of the funnel is where you win or lose the ground you have already gained. So make it count and appeal to every user who has made it this far in the funnel. The adage is right. Content is king. There is no industry that can do well online without it. However, we must keep in mind that we do not create content to please only Google. We create it to please our queen, the user. After all, even Google is making sure to optimize its search engine results to please the user. The user rules. So we must know our users, who they are, what they want and what they need—and we must give them the best experience we can. That is, unquestionably, the best way to rank. Author Troy Lambert, an active member of the International Thriller Writers Organization recently released a short novella in the Ridge Falls series, titled Typewriter Repair Shop, and a collection of short stories also in the Ridge Falls series, titled Into the Darkness with Marlie Harris. Brand Switching Analysis | Keep The Customer!